The world of maintenance management is moving at hyper-speed. While in the not-so-distant past, many facilities relied on a paper-based punch card system to track work orders, today’s maintenance teams need near-instant access to information in order to make decisions about their assets and facilities. 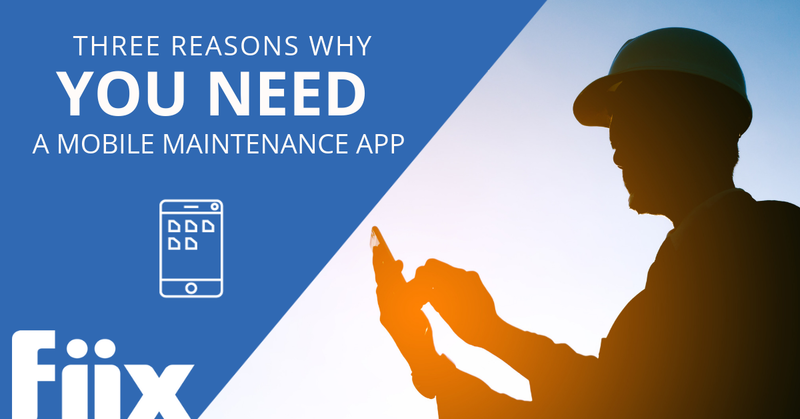 For most maintenance teams, this means going mobile—that is, choosing a CMMS that offers a mobile app that technicians can use in the field. Preventive and scheduled maintenance is one thing, but what if something goes wrong? Reactive maintenance is a reality—things break, and sometimes the only thing standing between a small repair and major downtime is how quickly you can notify the right technician for the job. But sometimes this means physically tracking down technicians, which can take way too long. Mobile CMMS apps let you avoid the wild goose chase by sending a notification straight to the technician, along with all the information about the damage, required parts, priority, etc. Push notifications make it so that technicians don’t even have to open the app to receive an alert. Instead, the notification is pushed directly to the user’s home screen, ensuring the right information gets into the right hands even faster. Data entry should not be a full-time job for your technicians. They should be spending more time in the field than in the office. After all, that’s where the work is. It doesn’t make sense for technicians to run back to a computer terminal to log their work. Instead, a mobile app will give them a powerful CMMS that they can carry around in their pocket, allowing them to log work in the field in real-time. Do you know how much maintenance goes untracked in your facility? It’s pretty common for little tweaks, adjustments, and repairs to get dismissed as too insignificant to bother logging in a desktop CMMS. However, these small repairs add up, and while your assets probably end up looking great on paper, they might not be doing so well in real life. When we look at untracked maintenance through the lens of asset lifecycle management or even audits, these small repairs and hours of work that have disappeared into the ether can come back to bite you. But with a mobile app, a technician who spots a bit of work to be done here or there can log it instantaneously, with the click of a button. This gives you better oversight and a much clearer picture of what’s actually going on in your facility. Want to learn more about must-haves for any CMMS? Read our guide on the most important features to look for.